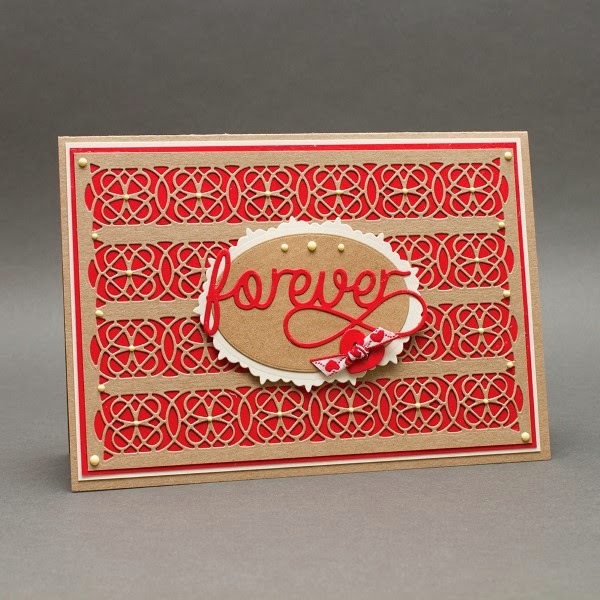 I used an A5 kraft card blank for this card with a layer of cream, red and finally kraft card again on top. I used the long verso inner pattern strip die and cut it four times to fill the top card layer evenly and glued it in place. The ovals were cut from the With Love Essentials Die Set and the Forever sentiment was cut from Inspirations Sentiment die set and the little heart was cut from the Someone Special Essentials die set, I cut it from red card and thread a small amount of heart ribbon. I finished this card off with some Buttermilk Nuvo Crystal Drops. See Karen's original post on her blog here.